The Colorado Electroencephalography and Brain-Computer Interfaces Laboratory (CEBL) version 3 is the latest version of the flagship BCI software under development at the Colorado State University BCI Lab. 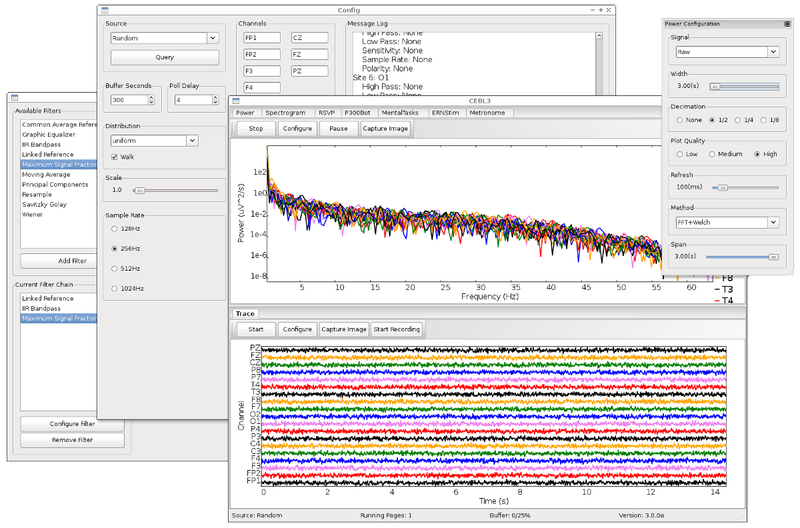 CEBL3 is written primarily in Python and is intended to be useful for offline analysis of EEG signals as well as performing interactive, real-time BCI experiments. CEBL3 has a modular architecture making it straightforward to add new real-time BCI components (called pages) as well as signal processing routines and machine learning algorithms. A flexible EEG container and a system for marking and segmenting the data. Various filtering and smoothing algorithms, including IIR, FIR, moving average and Savitzky Golay. Routines for analizing and visualizing EEG in both the time and frequency domains, including traces, power-spectral densities, continuous wavelet transforms and algorithms for interpolating values between EEG sensors in 2d,3d and spherical representations. Various machine learning algorithms, including Linear and Quadratic Disciminant Analysis, Logistic Regression, Recurrent and Convolutional Networks. Support for real-time data collection from the g.tec g.mobilab+, g.tec g.Nautilus, BioSemi ActiveTwo, OpenBCI, Neuropulse Mindset-24R. Routines for collecting and processing streaming real-time EEG signals. Please visit the official CEBL3 home page for more information. The latest version of CEBL3 is now available on github. Stay tuned for installation instructions, tutorials and more!